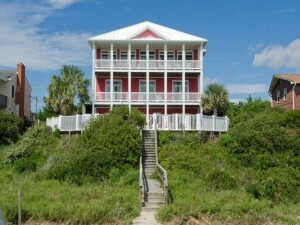 You can always find treasure along the beach, and this week’s featured property, Coral Treasure, is no exception. 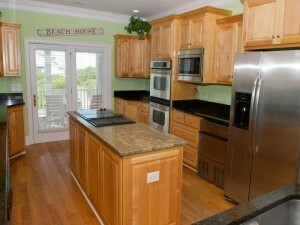 This home is the definition of an upscale beach house and is grand in size to fit your entire family! This 8 bedroom, (4 kings, 3 queens, 1 double and 1 single), 6 ½ bathroom, second- row cottage features two master suites, each with private baths, whirlpool tubs and deck access. Upon entering the professionally-designed Coral Treasure, you will be surrounded by high-quality furnishings and luxury finishes in a magnificent reverse floor plan. 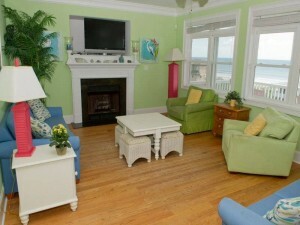 The bright, beachy décor is sure to remind you to relax and enjoy your well-deserved vacation. This kitchen is extraordinary in every way – featuring granite countertops, an island and all major appliances, plus double wall ovens, a Jenn-Air cooktop, an ice machine and a dishwasher. The cook in your family is going to love this space. The dining room table seats up to 12 people, and an additional 4 can fit at the bar top so there is plenty of room for everyone on your trip. Coral Treasure also features a game room on the ground level with foosball and pool tables, wet bar, mini refrigerator and half bath. The media room is also on the ground level with a 46” TV and DVD player. You can also find a washer/dryer, 9 flat screen cable TVs, DVD player, stereo/CD player, wireless high-speed Internet access, gas fireplace and ceiling fans throughout. Step outside of this magnificent home and discover your private, oceanside swimming pool and large hot tub (heated pool option available). 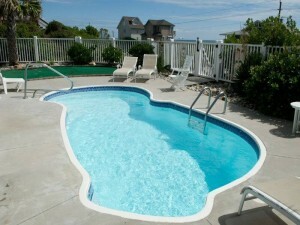 Pool-side, there is a built-in gas grill with prep station; there is also a putting green.  You can also find expansive covered and open decks on all levels that offer a variety of porch furniture including rockers, chairs and chaise lounges. 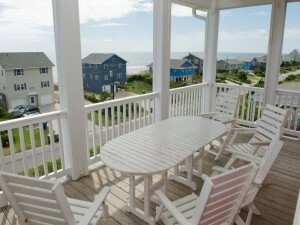 Check rates and availability for this oceanfront cottage and view additional property photos of Coral Treasure.